Hand thread chasing is a skill many turners would like to acquire and would undoubtedly find useful, but for various reasons - one of which being cost - few actually master. Many people have looked at this problem trying to find a solution. One suggestion was a "double" tool that had both the male and female chasers. Sadly this was not successful, as in order for the female chaser to fit into small holes the male chasing part became almost non-existent. Through their ingenuity, turners have always found alternative means for performing the same task. I am uncertain how many others have tried the method I am about to explain, but I feel sure that it is not the first time it has been adopted. Simon Hope, although not the first to do so, told me about it several years ago. The new HSS Ashley Iles Uni-chaser tool overcomes the problem of cost by using what is essentially a female chaser for both male and female threads. All right hand threads are cut from right to left - therefore with only the female chaser, female threads are cut as normal and male threads are cut by turning the tool over 180 degrees. 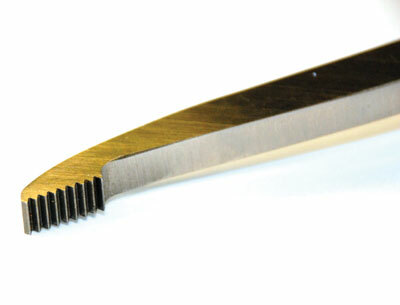 The sharpened underside is now used for cutting the male thread with a similar action. Sharpening is also simple. Merely hollow grind each face independently on the top surface - there is no need to touch the teeth. In between grinds, you can also touch up the cutting edge with a diamond slipstone. At present only a HSS 16tpi version is available which simple to use, together with the carbon steel armrest and recess tool. Other sizes will follow, including 20tpi. It is not intended to be a replacement for the existing method using separate male and female chasers. Instead, it is a brand new and equally effective alternative, providing a financially viable way of learning the art of thread chasing for turners who may not have previously had the opportunity. As with all Ashley Iles tools, the Uni-chaser is unconditionally guaranteed without time limit. 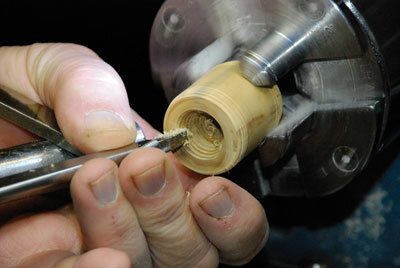 The manufacturer will also re-sharpen any of their tools for free (plus return postage). If you have tried the tool and are still not convinced, you can return it for a full refund. "The Uni-chaser is unconditionally guaranteed without time limit"